CATHRYN A. MANDUCA (cmanduca@carleton.edu) is NAGT executive director and director of the Science Education Resource Center at Carleton College, Northfield, Minnesota, HEATHER MACDONALD (rhmacd@wm.edu) is a professor of geology at the College of William and Mary, Williamsburg, Virginia, and LAUREL GOODELL (laurel@princeton.edu) is academic laboratory manager for the Department of Geosciences at Princeton University, Princeton, New Jersey. They were the conference chairs for 2015. Many participants in the Rendezvous came to meet other faculty and to learn about how they teach different aspects of the geosciences. 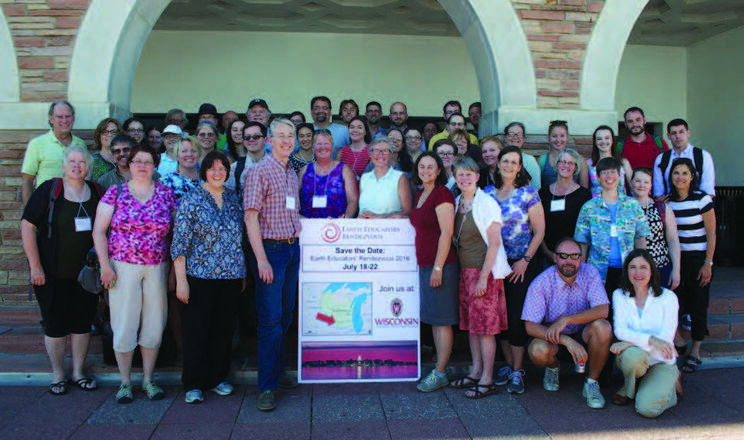 The first ever Earth Educators' Rendezvous, held at the University of Colorado in Boulder in July, provided more than 300 participants with a new kind of opportunity for learning and sharing in order to improve Earth education. Many attendees were geoscience faculty, but participants also included faculty from a wide variety of disciplines — from English to environmental science. The program drew format ideas from professional society meetings, multi-day workshops, and other week-long meetings. Morning workshops covered topics such as "Implementing the Next Generation Science Standards," "Making the Most of Your Intro Course," "Strengthening Your Department or Program," "Improving the Odds of Student Success," and "Synthesizing Geoscience Education Research." In the afternoon, participants sampled a variety of mini-workshops and attended poster sessions and companion oral sessions during which attendees shared their own work. Topics included teaching systems thinking, strengthening the capacity of programs to support all students, and teaching with large data sets. Each day the formal program ended with a high profile plenary speaker or panel. Nora Newcomb (Temple University psychologist) discussed the synergistic interactions between cognitive science, education research, and geoscience education research. John Matsui (Berkeley Scholars Program) discussed what is needed to provide support for diversity within an academic program. Patty Limerick (University of Colorado historian) chaired a panel addressing different points of view surrounding fracking. Daniel Wildcat (Haskell Indian Nations University environmental educator) described how a deep understanding of the Earth as a system can transform your life, drawing on examples from Native American culture. The multiple program elements allowed participants to customize their Rendezvous experience, mixing and matching topics and formats that were of highest interest to them. For most, networking and collaboration were key components of the meeting: one participant reported gaining new collaborators and initiating three new research projects. Another indicated at least five "wonderful, valuable takeaways," including "backward design writ large and deep, and qualitative research methods." Others focused on particular teaching strategies, on ideas for serving diverse student populations, or on ways to teach climate change. The multi-day morning workshops distinguished the Rendezvous from other types of professional meetings. Not only did the workshops provide opportunities to explore topics in more depth, but they also turned out to be very effective in generating new collegial contacts. In addition, many of the ideas put forward as the most important takeaways from the Rendezvous had their origins in the morning workshops. I was so unaware of all of the research into good educational practices and not very familiar with the resources available...I gained inspiration from all of the educators putting (their already overcommitted) time and effort into improving the educational experience for their students. I also have more confidence in my ability to find resources (both material and people) to help me work towards my goals. When the week was over, participants reflected on what they had learned at a town hall meeting. On the top of their minds was the value of this gathering as an opportunity to share, learn, and network. They reemphasized the importance of teaching that engages students in learning, indicated that they felt empowered and energized to try different approaches, and recommended the Rendezvous website as a resource for others interested in learning more. "This was one of the highlights of my summer, thanks to the group of people there and the leaders' preparation," noted one participant. The Rendezvous was a community effort, planned by a 19-person planning committee and a 7-member contributed program committee and managed by NAGT staff. Organized in collaboration with the NSF-funded On the Cutting Edge and InTeGrate projects, the event was supported by registration fees, contributions from AGU, GSA, and NAGT, and grants from the NSF. 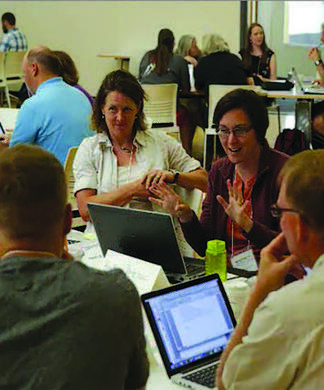 Planning is already underway for the Second Earth Educators Rendezvous, to be held July 18-22, 2016, at the University of Wisconsin, Madison. To learn more, visit the Rendezvous website at: http://serc.carleton.edu/earth_rendezvous. Participants gather at the end of the conference to celebrate the 2015 Rendezvous and look ahead to the 2016 gathering.